Naked Juice Smoothies and Coconut Water. If you like your beverage Naked, then PepsiCo has you in mind. Naked Beverages and PepsiCo have increased their product line with the addition of two new smoothies, two new coconut-water smoothies, and a 100 percent pure coconut water. The two new vegetable-packed smoothies include Berry Veggie Machine and Orange Carrot. The Berry Veggie Machine is a blend of purple carrots, sweet potatoes, red beets and sweet corn blended with cherries, strawberries and plums. The new Orange Carrot smoothie is a mix of one serving of veggies and two servings of fruit. PepsiCo/Naked Beverages also added two reduced calorie smoothies. 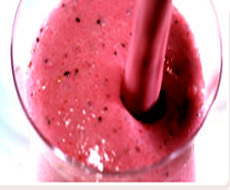 Tropical Smoothie With Coconut Water and Peach Guava Smoothie With Coconut Water have reduced calories by 35 percent. The Tropical Smoothie is a blend of pineapple and mango and coconut water. The Peach Guava Smoothie, of course, contains peach and guava juice along with the coconut water. Rounding out the new health conscience drinks is the 100 percent Coconut Water. The drink is extracted from Brazilian coconuts. It has no preservatives and no added sugar. It is all natural, fat free, cholesterol free, and gluten free with only 60 calories per 11.2 ounce bottle. You’ll find Naked’s 100 percent Coconut Water in the functional beverages and grab-and-go sections in Whole Foods nationwide. Suggested price of $1.99 each.